You won’t believe how simple these ornaments are to make… and they fill your home with the wonderful scent of cinnamon! These are a great craft for kids to make. Not only can you put them on your own tree for years to come and remember the fun Christmas memories of making them, but they make great gifts for the grandparents too. My kids just love helping make these— and we make some nearly every year! The good news is, they are pretty inexpensive to make. I bought generic cinnamon (2.5 oz) for $0.88 and the name brand cinnamon was $4.68! So right away, that is a savings of 80% on ingredients! 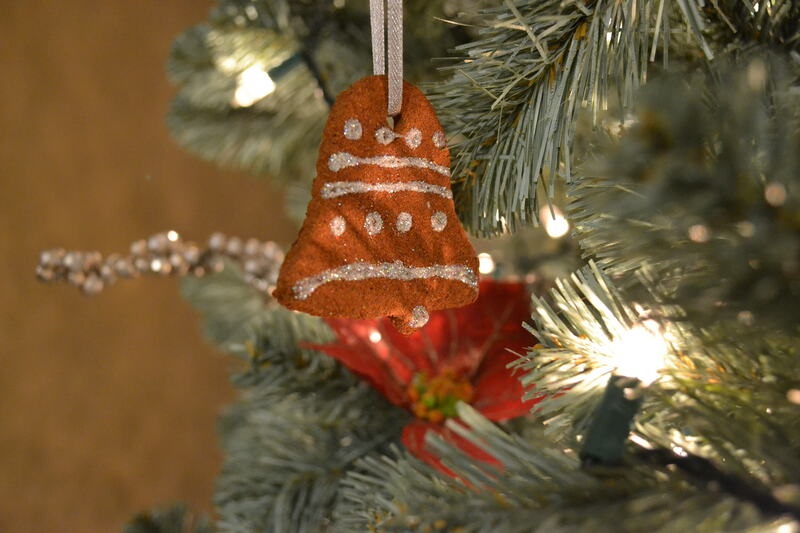 To make 24 of these ornaments only costs around $3. That’s all you need! Just mix together until dough forms, roll out (to about 1/4 inch thickness) and use your favorite cookie cutter shapes to make your ornaments. Just remember, if your dough is sticking as you roll it out, “flour” your rolling pin with cinnamon. Once your ornaments are cut out, you must use a toothpick, a craft stick, or even a straw to poke a hole in the top so that you can put a ribbon through to hang on tree. Or, if you want to string them for garland, you will want to place 2 holes in the middle of the ornament, at least 1/2 inch apart. Optional: lightly press glitter onto the ornaments while the dough is still moist and let it dry into the dough for decoration. Once the ornaments have dried for at least 24-48 hours, use glue to decorate after the ornaments with glitter, sequins, or whatever your choose. Put ribbons through the holes and decorate your tree! Shop at the dollar store or an overstock store for these ingredients, or even ask your local grocery store for damaged containers of applesauce or cinnamon, you may be able to save a bit of money on these items. Also be sure to look for generic brands of these ingredients for extra savings. SO fun! I need to do something like this with my boys! It is fun! My kids love it… hope yours will too! They do smell wonderful! I store them in a plastic bag from year to year in the Christmas decorations and they smell so good, who needs potpourri?! Oh how fun are these!!! Can’t wait to try, looks like a lot of fun for the whole family to enjoy. Pinning! I hope your family enjoys making them, Heather! I bet that these smell gorgeous! I will be trying these out very soon! We always made these growing up. I need to remember to make them again! Pinning! !